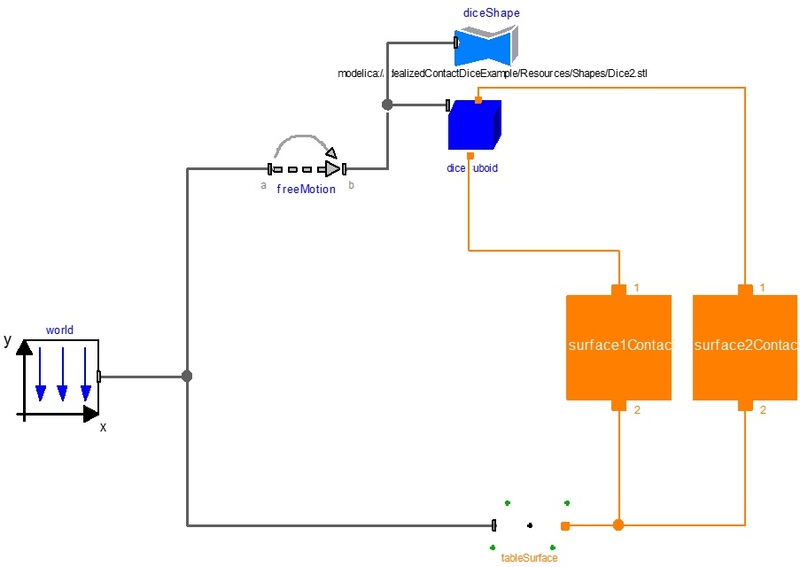 This is a simple demonstration of the ability of incorporating an element of surface contact to a model; it demonstrates a model of a dice being thrown onto a table with some quick notes on how it was created using the IdealizedContact library. For the dice example three rectangular surfaces are used to represent the top and bottom of the dice and the surface the dice is rolled onto. Figure 1: Dice bouncing along table. The Modelica model consists of the IdealizedContact library cuboid coming into contact with a rectangular surface. For this simulation only the vertices of the dice come into contact with the flat tableSurface, hence of this only the top and bottom surface of the dice need to be included. The dice was chosen to have a width of 2cm and a density of 1000kg/m3. The surface contact was set to be very stiff with a stiffness and damping of c=1e6 and d=1e6. The Modelica.Mechanics.MultiBody.Visualizers.FixedShape model was used to visualize the dice. The stl for the dice was created by jsirgado and can be obtained from here: http://www.thingiverse.com/thing:303286 (Creative Commons ShareAlike licence). URI referencing as described in Section 13.2.3 of the Modelica Specification is used for assigning shapeType (i.e. 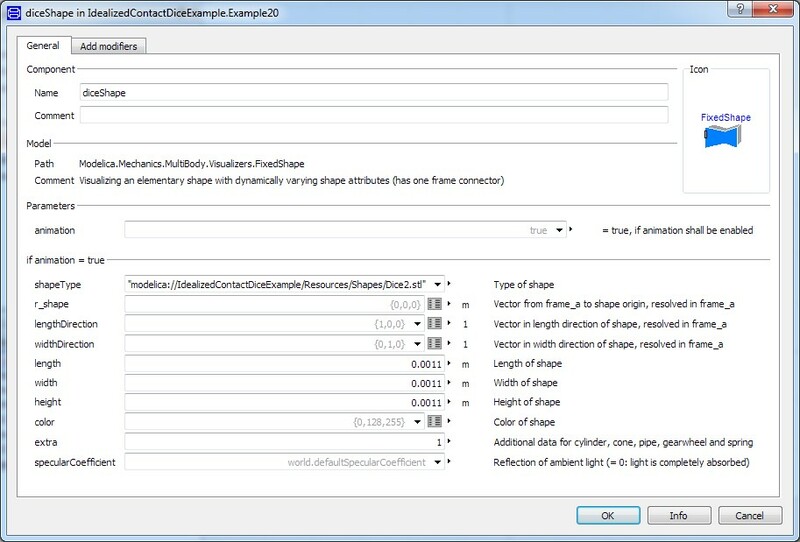 shapeType=”modelica://IdealizedContactDiceExample/Resources/Shapes/Dice2.stl”). The stl animation was scaled by setting extra=1 and length, width and height to 0.0011. This scaling was required due to the scaling of the animation in the stl file. The Modelica model is available to be downloaded here, Fun with dice example, and can be examined by readers with a Dymola license who have downloaded the idealizedContact library.